Calendars are how people visualize their day. When dealing with multiple schedules, for potentially multiple employees, each time of which may or may not have bookings for them already, calendars can be daunting though. That's what we have worked hard to avoid with our latest new feature announcement: FlexBooker now has calendars to help you manage your appointments and bookings. We think our implementation is, well, beautifully simple (and simply beautiful). The calendar can be seen by managers in its entirety (either day or week) and can also be filtered by employee. It is also handily color-coded, so you can see at a glance who has appointments, and where the bookings lie. Of course, it's still amazingly fast. We've also combined our schedule setup area into the same page as the calendar, so you can perform all your day-to-day activities from one page. We think you're going to love the new look. The search functionality is still there, so you can easily search your entire schedule, even by one of your customer's names, to quickly see his history and upcoming bookings (still on the same page!). As always, now back to work to continually improve FlexBooker for you. Responsive and Helpful Support. By both email and phone. Everyone claims to have it, but we really strive to give our customers the best customer support possible. We don't like to work in days, or hours, but instead in minutes to respond to a customer question. The same drive runs throughout the company, from support to sales. Everywhere we interact with customers, we want the customer to come away with a true "wow" feeling. We're excited to announce a brand new FlexBooker feature: Wait Lists. What are FlexBooker Wait Lists? FlexBooker Wait Lists are a powerful way to help keep your appointmets full, allowing your customers to place themselves onto a wait list for any full appointment. A wait list is not a confirmation or a booking, but is instead a way to automatically get a spot if space opens up for them. 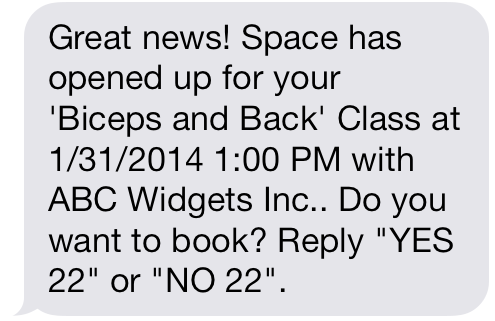 In the event of space opening up for a wait list party, FlexBooker automatically sends the customer a text message, allowing them to turn their wait list request into a confirmed booking. What can cause space to open up for my customers who are on a wait list for a particular time? Is space held for wait list parties? Yes, for a period of exactly 10 minutes from the moment space opens up (at which time the wait list customer will receive a text message asking if they would like the booking) space will be held for that customer. If they don't respond within that 10 minute time frame, then the space goes back to the widget to allow your other customers to book. What happens if multiple customers are waiting for space at the same appointment? If there are multiple customers waiting for space at the same booking, then they will be offered space as (and if) it opens up in the order that they joined the wait list. First come, first offered. If a party above them in the wait list doesn't respond to the SMS within 10 minutes, or rejects the SMS offer, then the next party in the wait list will be text messaged. This is another great evolution to the FlexBooker online scheduling offering, and we're so happy to be able to now offer this often-requested feature to our customers. Not a customer yet? Check out what all the fuss is about. Now, we thought, what's true of gyms should apply to other types of business. Over the last several months we've been working closely with folks in several other businesses to adapt FlexBooker to work for them too. Rather than trying to come out with a one-size-fits-all approach (as some of the other guys do), where each user has to spend hours fiddling through endless settings, we do the work for you. By choosing one of the business types (and we have quite a few now, and are working to grow the list as we learn more and more) we will automatically configure your account for you. The feedback so far as been great, and we truly appreciate how open and helpful so many of our customers have been. Give us a try, for 60 days(!) completely free of charge (no credit card required) by signing up for an instant free trial. We feel strongly that we offer the best solution out there for businesses looking to accept bookings online. But we're not resting, we have lots of awesome features and improvements in the pipeline. More to come on those in upcoming posts.